I don't understand the sheep owner's indirect comment in the FJ article that the sheep is fine foraging for itself. My understanding is that sheep need live grass, or at least green vegetative material--quite unavailable when it's this cold out, even if the snow's pawed away--and unlike whitetail deer don't have the right winter rumen-bacteria to digest twigs and other woody material. Yes, maybe the sheep can live off its fat for a while, but that's not quite the same thing as saying it's fine on its own. 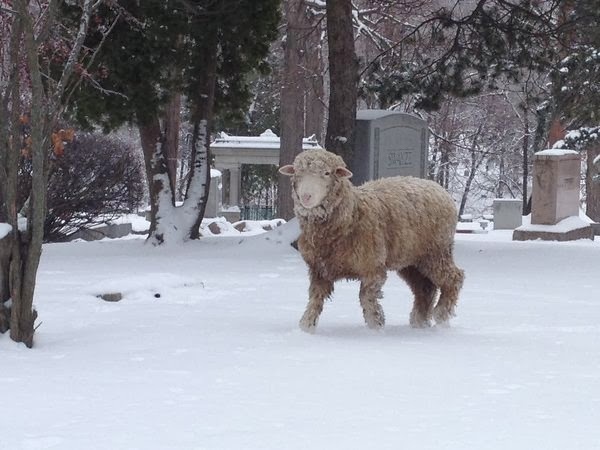 If they want to find this sheep before it starves and freezes, they should forget about the gaggle-of-humans approach, and instead just bring in a trained cold-weather herding dog that does the Find command well. Presto, one sheep.